Songs of Eretz Poetry Review is pleased to present "Apotheosis" by Shannon Connor Winward. Ms. Winward's poetry has appeared in: Pedestal Magazine, Strange Horizons, Fairy Tale Magazine, Literary Mama, Hip Mama, Star*Line, Illumen, Ideomancer, and Dreamstreets. Her debut poetry chapbook, Undoing Winter, is available from Amazon.com, Finishing Line Press, and from the author at www.shannonconnorwinward.com. Ms. Winward lives and writes in Newark, Delaware. will sing you in circles. Poet's Notes: I am a spiritual person, but my faith has always involved ambivalence – a (justifiable, I think) pissed-offedness at whomever/whatever is responsible for this beautiful mess of humanity. On the other hand, I'm a lover of myth, a Jungian fan-girl, and generally in favor of free will. The Creative Principal may be primordial, but religion is a human invention. We make our own way; we tell our own stories. I think we are as responsible for our gods as they are for Us – at least our understanding of them and how they manifest. "Apotheosis," (which means "elevation to divine status") is a sort of playful/not-playful exploration of what it means to be engendered, begotten – created – in this sense. 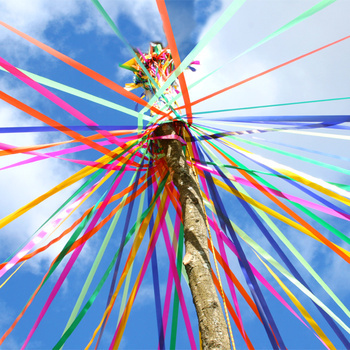 The maypole, with its piquant pagan symbolism and sexual overtones, just sort of rose up (see what I did there?) as a natural motif in the original draft, which was originally titled simply "Freedom". At heart, "Apotheosis" is a Declaration of Independence – insofar as one can meaningfully thumb her nose at God. Editor's Note: I find this poem to be an interesting take on philosophy's age old question of who created whom, with a sprinkle of refreshingly not in-your-face feminism. "Apotheosis" was first published in NewMyths.com in December 2011.